One correction - that was also wrong on the Wiki list - from the 2002 WRWC. Ireland 23 Japan 3 (NOT 0-18). Portugal go up from 16th to 15th in the current rankings. How the ***** can a team that has only played one test, which the lost heavily, 20 years ago end up RISING in any sensible ranking system? And Patricia Garcia's missed drop goal has proved VERY expensive! 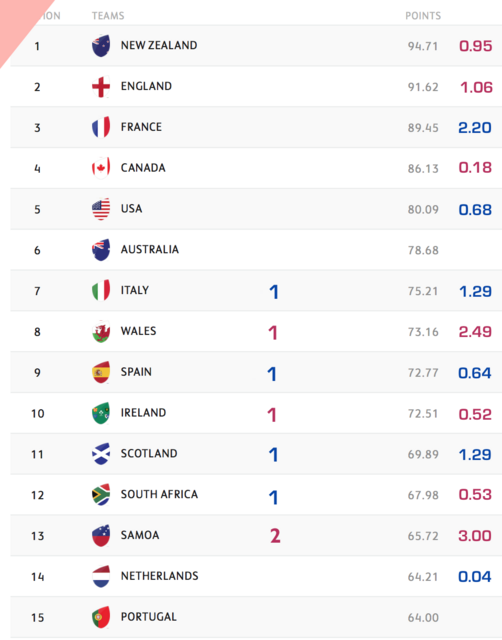 Because if World Rugby had to clean women's rankings due to team inactivity just like they do with men's then they would see the poor state of global women's XV exposed. Of the five games Canada played, only two counted for ranking points, and the one vs Australia barely so. Only 15 games among 30 counted for the World Rugby rankings : 2/6 on day 1, 2/6 on day 2, 3/6 on day 3, 3/6 on semis and 5/6 on finals ! New Zealand : 2 (0-0-1, 0, 1). England : 2 (0-0-0, 1, 1). France : 4 (0-1-1, 1, 1). USA : 3 (1-1-0, 0, 1). Canada : 2 (0-0-1, 0, 1). Australia : 4 (1-1-0, 1, 1). Wales : 1 (0-0-0, 0, 1). Ireland : 4 (1-0-1, 1, 1). Italy : 4 (1-0-1, 1, 1). Spain : 3 (0-1-1, 0, 1). Japan : 1 (0-0-0, 1, 0). Hong Kong : 0 (0-0-0, 0, 0). Movement over the entire tournament. Portugal & Netherlands both jumped a spot by Japan falling. Wales improved the most, going from 10th to 7th. Ireland fell the most, going from 5th to 9th. sjbret wrote: Only 15 games among 30 counted for the World Rugby rankings : 2/6 on day 1, 2/6 on day 2, 3/6 on day 3, 3/6 on semis and 5/6 on finals ! What exactly is your point? Should games against much weaker teams count for the rankings? I would propose a system were you simply lose 10 ranking points if you don't play a game that very year. Will balance the Women's ranking out without reducing the "numbers". RugbyLiebe wrote: What exactly is your point? Should games against much weaker teams count for the rankings? Serge wrote: I wasn’t satisfied enough by the official World Rugby’s ranking which presents according to me many qualities but which, and I regret it, only concerns a restricted number of countries. The ranking doesn’t take in account the level of the teams which is the main criterion I retain for every match because the World Rugby’s principle is simple : the winner gains some points, the loser loses them. It doesn’t take into consideration the games against the countries which aren't members of World Rugby, even when the tournament is organized by a World Rugby affiliated federation, nor does it the matches against the teams I called special (Nomads...), as well as those against ranked teams having a difference of more or less than 10 points in a 0 to 100 ranking. Finally, any introduction in the World Rugby’s rankings is arbitrarily fixed, no matter what the previous results of the countries are. For every international match, I've attributed since 1982 for women, points to every country as a sum of several elements. I mainly take into account the match level (generally the points average of the 2 teams before the match, with minima) and the kind of result (win, draw, defeat or forfeit). But I also count the match venue (at home according to the opponent from the continent or not, in an other country of its own continent, on neutral ground, in a country of the continent of its opponent, away according to the opponent), the number of scored points and the difference between the number of scored points and the number of scored points by the opponent. Finally, I add a bonus for WRC. There are a few exceptions in this method, in particular when countries play A, B , Emerging, Amateur, Junior, Student, Army, Police or Services teams, even provinces or clubs in official competitions. In an official competition too, results of A, B, Emerging or Juniors teams can make the said country points marginally move, with a specific calculation. Finally, matches results with « special » teams (Nomads, Caribbean Select) are counted and these teams classified apart. The points number after the match is equal to the sum of 10% of the match points and 90 % of the points number before the match (possibly 20 % and 80 % for women's teams playing very few or in the World Cup). This method allows to take less into account surprises and requires regularity in performance to progress. Besides, it favors countries the level of which improves by often playing to the detriment of those who play few, the number moreover decreasing in 2% each year. To present my rankings on October 2009, I worked more than 2 years to compile men's data and one year to compile women's data from all the important sites (thanks to them). And also to realize multiple tests which allowed me to validate the method. *The first official women’s full international match was played in 1987 and since then the number of women’s matches is considerably fewer than the number of men’s matches. *There are a number of women’s teams who do not play regular matches. *As a result of the relatively small number of matches compared to the men’s and the discrepancies in the number of matches played by different Unions the effect that one result will have on the rankings could unfairly skew the result. *To combat this effect, it has been decided to start all teams out on 80 ranking points (an arbitrarily chosen figure which does not have any bearing on the subsequent results of the rankings) in 1987, then for each year between 1987 and the year that an individual Union played their first women’s full international match 2 points are deducted from their total. *This deduction occurs up until 2007, so if a team plays their first ever full international after 2007 then they will begin with 40 ranking points. I tried to summarise the both first years of World Rugby official rankings. Firstly, I'ld want to say and repeat that WR rankings have a main quality : they exist. And we waited them since a too long time ! And if we aren't satisfied by the method, it's always possible to create another ranking as in Serge's archives. Since february 2016, 140 XV women's games have been recorded by WR with a WR number (from 23073 to 25787). If we eliminate the both Barbarians games (Vs Munster & British Army) and the 3 matches with a single country (Czechia Vs Brown University, Wales Vs British Army & Australia Vs Auckland), we have 135 games between 2 countries, including a total of 24 playing countries. In the 135 games, 77 (57 %) were used for the rankings (among which 8 couldn't according to the method). And 58 (43 %) were not (among which 7 could). By country, the data are following. Other Countries : 32 with 14 (44%). Belgium (5 games/3 counted, 22th/20th), Netherlands (5/3, 14th/16th), Switzerland (5/0, 37th/22nd), Germany (4/1, 19th/19th), Russia (3/2, 20th/21st), Fiji (3/1, 30th/27th), Czechia (3/0, 52nd/24th), Zimbabwe (1/1, 38th/45th), Papua New Guinea (1/1, 42nd/49th), Botswana (1/1, 43nd/50th) & Singapore (1/0, 34th/25th). Samoa (12th/15th), South Africa (13/13), Portugal (15/63), Kazakhstan (17/17), Sweden (18/18), Trinidad & Tobago (21/30), China (24/29), Denmark (25/37), Jamaica (26/34), Guyana (27/44), Romania (28/32), Norway (29/31), Kenya (31/26), Bosnia & Herzegovina (32/53), Thailand (33/35), Uzbekistan (35/36), Cayman Islands (36/33), Tonga (39/39), Namibia (40/58), Uganda (41/28), Luxembourg (44/41), Finland (45/23), Brazil (46/46), Serbia (47/46), Barbados (48/51), Saint-Vincent & the Grenadines (49/61), Bahamas (50/55) & Philippines (51/40). Lastly, 15 games (50%) were counted in WRWC among the 30 played and 23 (51%) among 45 in the three 6 nations (6 among 15 in 2018). If a team doesn't play any match in two years, they shouldn't be in any serious world rankings. How the hell is Botswana in the top 25, yet they don't honour fixtures? They barely have a 7s team turning up with 10 players, instead of the required 13, so how on earth did they even make an xvs team? well, they played Zimbabwe TWICE last year. You need to work on your reading skills. They are not in the top 25. This is my ranking. They are one of just 25 women's national teams who played 15s internationals in the last two years. So they are 25th out of 25. What an achievement. They barely have a 7s team turning up with 10 players, instead of the required 13, so how on earth did they even make an xvs team? What nonsense you write. Where did you get that information from? Botswana has always pitched up to RA 7s tournaments with the required TWELVE players - RA does not allow teams to have 13 players. They have played Namibia, Zambia and Zimbabwe in 15 aside international matches and had the required 22/23 players each time. You should stop making up stuff and posting it! rey200 wrote: well, they played Zimbabwe TWICE last year. Remarkably - and despite having only ever played one test, and that better than a decade ago - Brazil go from 46th to 45th as a result of Finland losing to Switzerland. World Rugby therefore have developed a ranking system for women's rugby that actively rewards inactivity. A comparison between end of 2017 and end of 2018 rankings (no more TM are fixed for this year). In blue the positions and points gained, in red the lost ones. There were few changes: Italy overcame Wales, Spain overcame Ireland. In an hypothetical European Championship it would be a great fight between these four nations for the bronze medal, with England and France running for the gold. Shame on Portugal being in this ranking. How many years haven't they played a single game now? Has Samoa actually played a game this year or was it a deduction for being inactive? Apart from that: should any other team being added to my 25 active national teams ranking or even one to be scrapped? 22 years for Portugal. Samoa played two games in the Pacific championship, being beaten by Fiji in the final. Papua New Guinea and Tonga played too.